Formed from the merger of the British colony of the Gold Coast and the Togoland trust territory, Ghana in 1957 became the first sub-Saharan country in colonial Africa to gain its independence. In 1957, Ghana became the first African nation to become independent from British colonization, inspiring many others to follow. Despite key accomplishments, Ghana still faces a number of significant socio-economic challenges, particularly in rural areas. Lack of clean water and sanitation are major challenges in regions around the Volta. Bonded labour, child marriage and exploitation of children also remain significant problems. An estimated 1.9 million children in Ghana are currently involved in child labour. International Needs Ghana was established by Rev. Walter Pimpong in 1984 with the aim of improving deprived communities through development and human rights initiatives. In 1998, International Needs Ghana led a campaign that gained attention all over the world to abolish a practice of Shrine Slavery known as Trokosi. Find out more about this project here. Ghana has a population of 26 million. Ghana has a young age structure, with approximately 57% of the population under the age of 25 and over 1 in 4 of the population are under the age of 14. 30% of children in Ghana do not complete primary school, and 60% of children do not complete secondary school. (UNICEF 2015). Agriculture accounts for about 20% of GDP and employs more than half of the workforce, mainly small landholders. Gold, oil, and cocoa exports are key exports. 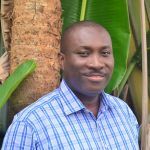 Edmond trained as a chartered accountant and has worked for International Needs Ghana for over 16 years. He became executive director of International Needs Ghana in 2014 and now leads a staff team of over 120 people. He also serves as Treasurer of the International Needs Network. Ed is married with 4 young children.